Another Marvel Cinematic Universe movie is tearing up the Box Office, and of course it has some end credits sequences. Two this time, which seems to be the minimum these days. Let’s get into what they were and what they meant! SPOILERS for Thor: Ragnarok obviously follow. This text is here for scroll buffer. Our first one begins mid-credits after the fancy motion graphic/animated main cast and crew sequence. We see the ship that Thor, Loki, Korg, and the other dozen or whatever Asgardians are on. As they continue on course with Earth, they confront a sinister looking spacecraft that has hints of the Chitauri (previously seen in the first Avengers film) in it’s design. The scene ends. Well, Kevin Feige has gone on record on this one, telling the world at large that this is in fact the Sanctuary II. This vessel belongs to the “Big Bad Guy” of the upcoming Infinity War movie, Thanos. So, it seems that things will not work out just fine for Thor & company. Steve and I speculated over on our Thor Episode of the Podcast that Thanos may take the Asgardian ship hostage, raising the stakes for Thor and Loki in the upcoming battle. 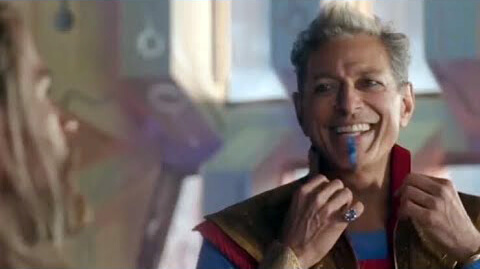 The second scene takes us back to Sakaar, where we find the Grandmaster down on the planet surface, confronted with the junk-scavenger people we saw earlier in the film. Jeff Goldblum’s Grandmaster proclaims “It’s a tie!” and the screen cuts to black. Nothing really, just another joke to end the film with. I hear some people suggest that this means that the Grandmaster is now dead, but I am fairly certain that he is effectively immortal like his brother the Collector – who was featured in the first Guardians of the Galaxy movie, played by Benicio Del Toro.